How did the Romans build and maintain one of the most powerful and stable empires in the history of the world? This illuminating book draws on the literature, especially the historiography, composed by the members of the elite who conducted Roman foreign affairs. From this evidence, Susan P. Mattern reevaluates the roots, motivations, and goals of Roman imperial foreign policy especially as that policy related to warfare. 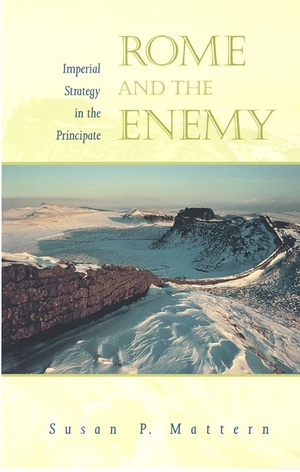 In a major reinterpretation of the sources, Rome and the Enemy shows that concepts of national honor, fierce competition for status, and revenge drove Roman foreign policy, and though different from the highly rationalizing strategies often attributed to the Romans, dictated patterns of response that remained consistent over centuries. Rome and the Enemy provides a fascinating look into the Roman mind in addition to a compelling reexamination of Roman conceptions of warfare and national honor. The resulting picture creates a new understanding of Rome's long mastery of the Mediterranean world. Susan P. Mattern is Assistant Professor of History at the University of Georgia.